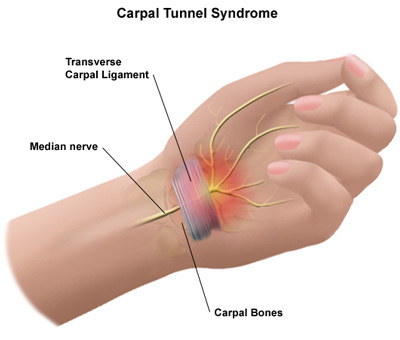 Repetitive stress injury is typically associated with people that work long hours on a computer and that are forced to repeat certain actions with the hands, wrists and even neck. 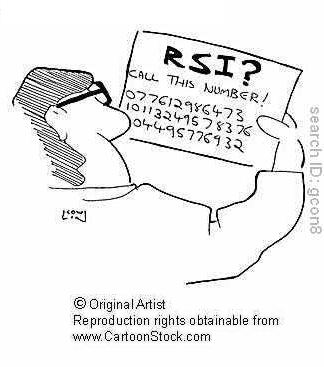 This affliction is quite common however, in many different work environments where no or little attention is paid toward the development of ergonomic workstations that can help prevent the development of repeated stress injury, also called RSI. Sufferers are not helpless, however, and there is much that can be done to alleviate the symptoms or to prevent the development of the condition. 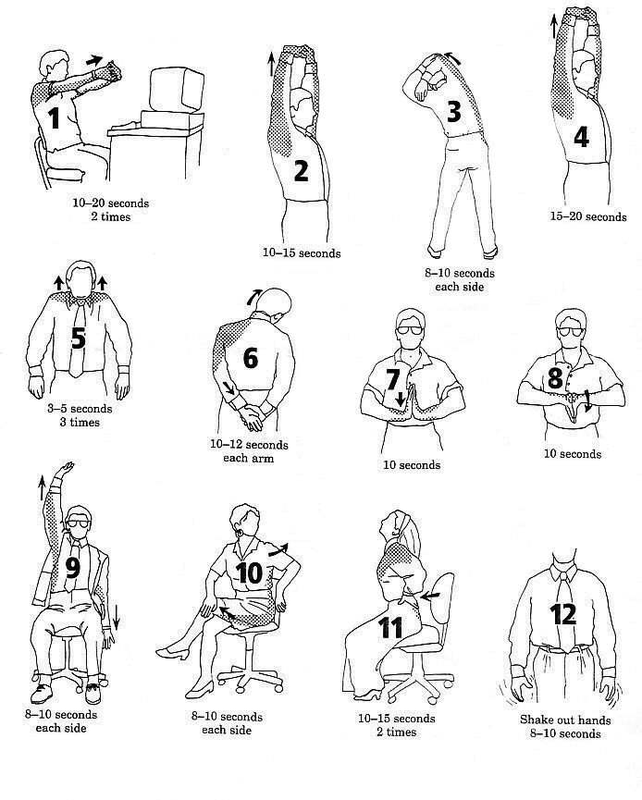 There are several exercises that can be performed without leaving a workstation and that will provide relief. By simply performing a few simple exercises during relaxation times, significant reduction of the symptoms can be achieved. As with most other health conditions, prevention is always better than cure and these exercises should be considered even when not experiencing discomfort from repetitive stress injury. Most of the exercises discussed here are designed to ensure that the blood flow to the various parts of the body is improved and that those muscles involved in repetitive movements are stretched and exercised. Most of the exercises require stretching for fifteen to thirty seconds at a time, repeated three times in all. It is important to choose exercises that can be comfortably done by the individual concern. Everybody has unique requirements and these types of exercises should never cause discomfort or pain. In such cases it may be best to reduce the frequency of exercises or to reduce the time that is spent on the stretching exercises. As with any exercise program, it is best to discuss the matter with a doctor, especially when pain is experienced. One valuable exercise is to hold the arms stretched outward while splaying the fingers of both hands as wide as possible. Hold this stance for a few seconds and repeat the exercise a few times. The muscles in the hands and forearms should contract. A variation of this exercise is to extent the arms in from of the body while all the fingers of both hands are squeezed a few times. A few repetitions of either these exercises will improve the blood flow in the upper and lower arms and the hands and fingers. A valuable exercise that can be comfortably performed at any type of workstation is to extend the arms away from the body, as far as possible. Next, place one hand over the fingertips of the other hand and gently apply pressure towards the body. This exercise should be repeated a few times, alternating the hand that is pushed toward the body. An extremely useful desk exercise is to sit down with the left hand curved toward the body with the hand forming a loose fist. The right hand is then used to push the left arm towards the body while the left arm resist the push. This exercise too should be repeated at least three times, alternating arms. Each repetition of the exercise should be maintained for at least fifteen seconds, but no more than thirty seconds. Finally, one of the best ways to deal with the symptoms of repeating stress injury is to massage the hands. Using a motion similar to that used when washing one’s hands, the blood flow in the hands can be improved and any pain and discomfort will disappear. It is important to be aware of the causes of repetitive stress injury; in the majority of cases it is caused by unvarying movement of certain muscles and limbs without respite. By simply changing the routine from time to time and by doing gentle stretching exercises regularly, not only can the symptoms be lessened, but the condition itself can also be prevented. It is also highly advisable to be aware of one’s posture. The problem can often be lessened or prevented by keeping the back straight while sitting. Getting to one’s feet every now and then also seems to help. Repetitive stress injury may not seem like a debilitating condition but the productivity of sufferers are almost always influenced. People that experience pain or discomfort simply cannot provide high levels of productivity. It is therefore important to understand that a properly designed workplace is of paramount importance to the productivity of the organization. With that in mind, repetitive stress injury should be addressed as quickly as possible. 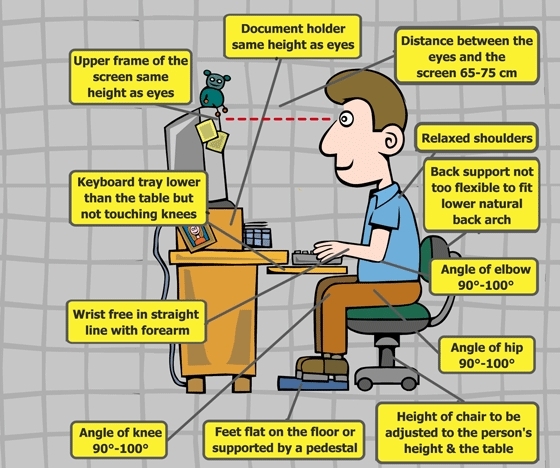 At Your Desk – Exercises for Repetitive Stress Injury How to Recognize Repetitive Stress Injury Computer Ergonomics and Repetitive Stress Injury What Are The Types Of Repetitive Stress Injury?